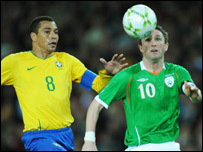 Robinho's second-half goal helped Brazil beat the Republic of Ireland in Wednesday's friendly at Croke Park. The Republic had plenty of early possession but Shay Given superbly denied Josue as Brazil started to look dangerous before half-time. Given came to Ireland's rescue again with a great save to deny Fabiano. Robinho's delightful finish put Brazil ahead on 67 minutes and despite some late Irish huff and puff, the visitors held on to claim the victory. Brazil's stronger than expected starting line-up included two Barclays Premier League stars in Alex of Chelsea and captain Gilberto of Arsenal. Aiden McGeady made a promising start for the Republic with his pace causing problems for Brazilian full-back Leonardo Moura. Sloppy play by Liam Miller then forced Lee Carsley to foul Robinho on the edge of the Republic box but Given easily saved Diego's free-kick. Brazil had a penalty claim in the 15th minute although replays appeared to show that Richard Dunne had not caught Diego in the box. The home side had plenty of possession in the opening 20 minutes but poor crossing, with Damien Duff guilty on a couple of occasions, meant that the visitors were under little threat. As the first half wore on, Brazil began to look more threatening thanks to their slick passing, although the Irish were getting bodies in the way at the crucial moments. Given had to make a sharp save at his near post to deny Josue in the 37th-minute after clever play from Robinho. The Republic made a promising start to the second half with Keane's clever ball almost sending Duff in the clear before Julio Cesar gathered. McGeady then should have been able to release the charging Duff but the Celtic man delayed his pass and the Newcastle winger found himself offside. The home side had a lucky escape when Diego's free-kick was deflected wide by Richard Dunne, after a Given misjudgement. The Republic threatened on the hour with Kevin Kilbane getting into a threatening position but unable to pick out a team-mate from his cross. However, Given came to the Republic's rescue on 63 minutes when he produced a brilliant save to deny Fabiano. As Brazil stepped up the pace, the goal finally came on 67 minutes with Robinho almost passing the ball into the net from the edge of the box with a glorious finish through Carsley's legs. Fabiano almost added to Brazil's lead in the 80th minute but he just failed to get a touch after Republic substitute Stephen Hunt had carelessly lost possession in his own half. The Republic produced a predictable late flurry but they couldn't create a chance of note as Brazil held on. The night was no disgrace for the home side but neither was it a display which would have especially excited the Republic's mooted main managerial candidates Giovanni Trapattoni and Terry Venables. Rep of Ireland: Given, Kelly, Dunne, O'Shea, Kilbane, McGeady, Miller, Carsley, Duff, Keane, Kevin Doyle. Subs: Joe Murphy, Hunt, Foley, Long, McShane, Bruce, Daryl Murphy, Whelan, Potter. Brazil: Julio Cesar, Leonardo Moura, Alex, Julio Baptista, Luisao, Josue, Silva, Richarlyson, Luis Fabiano, Diego, Robinho. Subs: Breno, Lucas, Renan, Anderson, Thiago Neves.